FRANKFORT, Ky. – It is now the first of April. If you asked most Kentuckians what it feels like weather-wise, they would say it is the first of March. The author holds a white bass caught last April from the Salt River just upstream of Taylorsville Lake. Average-sized white bass such as this one, usually male, are the first to migrate upstream during their annual spring spawning runs, followed by the larger females. The warm winds finally began to blow from the South earlier this week and brought the white bass upstream with them. The spawning runs are finally here. Water temperatures breaking the 50 degree mark combined with rainfall signal to white bass that it is time to move upstream to reproduce. They need a gently rising river along with sun-warmed water to begin migrating from the main lake into the headwaters of reservoirs such as Nolin River Lake, Taylorsville Lake, Cave Run Lake, Herrington Lake and Lake Barkley. Nolin River Lake has arguably the best white bass population of any Kentucky reservoir. The really good fishing occurs from Lick Run all the way upstream to Wheeler’s Mill. Bank anglers have good access to both sides of Nolin River at the Nolin River Voluntary Public Access Area (VPA) via KY 728 (Priceville Road) and Kesselring Road. Bank anglers also fish at Bacon Creek Boat Ramp and at Broad Ford. Boaters should not venture upstream of Bacon Creek Boat Ramp as Nolin River Lake reverts back to the pool and riffle habitat of the pre-impoundment river at this point, risking the health of any boat motor’s lower unit.Local anglers are catching white bass around the KY 248 Bridge in the headwaters of Taylorsville Lake in Anderson County. White bass run as far up the Salt River as the once-vibrant river trading town of Glensboro in spring. 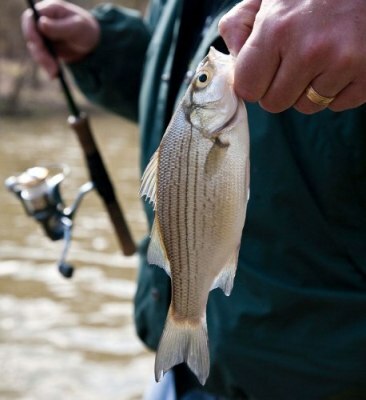 The headwaters of Herrington Lake will be churning with white bass with the warming weather. This historic run spawned lure inventions and a regional reputation for incredible fishing. The legendary white bass fishery in Herrington Lake went through a fallow period in the 1990s and early 2000s, but is now producing good numbers of white bass from 12 to 14 inches long. The good fishing starts near Bryant’s Camp Boat Ramp and upstream into Rankin Bottoms, near the KY 52 Bridge between Lancaster and Danville. Bank anglers may access Rankin Bottoms at the Dix River VPA site at the end of Rankin Road off KY 52 near the bridge. This site grants over a mile of bank fishing for white bass.With water temperatures just reaching the low 50s, white bass are moving into the upper reaches of Lake Barkley. They are also hitting in the Cumberland River just below Lake Barkley. When the flows modulate slightly after the recent rains, the white bass will be active below locks and dams on the Green and Kentucky rivers. White bass fishing inspires such ardor in anglers because these fish strike practically anything that comes near them during their spawning runs. No other fishing compares to it when white bass are really on and biting. Bank anglers can enjoy fishing just as good as those fishing from boats. Herrington white bass anglers invented the plunker and fly presentation, originally comprised of a piece of broom handle with an eyelet screwed into it. They tied a piece of heavy monofilament to the eyelet with a treble hook dressed in white marabou at the other end. They cast this rig into the boils of feeding white bass and popped the rod to draw the attention of white bass. Modern anglers use a white chugger-style topwater with the back hook removed. They tie a piece of light braided or monofilament line to the eyelet of the hook and attach a 1/32-ounce marabou jig or a dressed treble hook to the business end. Some remove both hooks to keep the rig from tangling on the cast. This presentation still catches white bass as well as it did in the 1950s. White or chartreuse 1/16-ounce marabou or feather jigs suspended under bobbers and allowed to drift downstream also work extremely well on white bass. Adjust the depth of the bobber until it disappears from a fish. In-line spinners of practically any color, small silver spoons and white 2 ½-inch curly-tailed grubs rigged on 1/8-ounce leadhead all score white bass. White bass are either right on top, a few feet deep or just above bottom. The depth you catch them changes from day to day and sometimes from hour to hour. Keep probing the water column until you find them. When they are mid-depth or deeper, the curly-tailed grub is hard to beat. The white bass are here, signaling this dreadful winter is finally gone for good. Get out in the next couple of weeks for the most exciting fishing found.